View More In I/O Port Cards. Have you spent too much time waiting for large files to crawl between a computer and an external hard drive? Don't fret -- USB 3.0 has arrived. Not only can it move data faster and provide more power, but it's compatible with USB 2.0 devices. This is a convenient laptop accessory, expresscard/54 to USB 3.0 adapter! 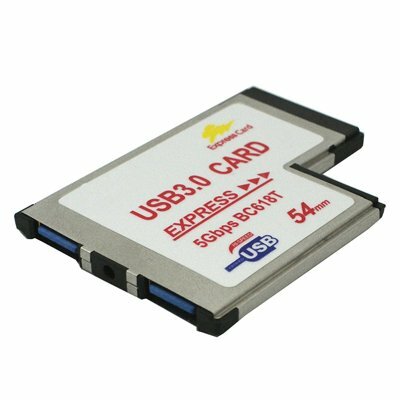 Using this card allow you to change the expresscard/54 into 2 USB 3.0 ports. Besides, with an USB bus power, you can connect to external AC adapter for power supply. Furthermore, it is very easy to use, just a simple plug and play connectivity and setup which is for your convenient uses. If you have any questions about this product by GMYLE, contact us by completing and submitting the form below. If you are looking for a specif part number, please include it with your message.